While I was searching for honey mustard dressing recipes a couple of weeks ago, I kept seeing Alice Springs chicken in the results, and had no idea what that was all about. Obviously, I had to check it out, and discovered it’s a “famous” dish served at Outback Steakhouse. I mean, I know all about the Bloomin’ Onion, but hadn’t heard of this before, but am SOOO glad that I stumbled upon it! It definitely packs a bunch with amazing flavor!! Combine mustard, honey, 1 tsp. oil and lemon juice in a bowl using an electric mixer. Mix for about 30 seconds. Place chicken in a large ziploc bag and pour about 2/3 of marinade over chicken. Marinate in fridge for about 2 hours (or longer, if desired). Chill remaining marinade for later use. After chicken has marinated, preheat over to 375° F.
Heat 1 tbsp. oil in a large skillet over medium heat, remove chicken from bag and sear on each side for 3-4 minutes until golden brown. Throw away bag with marinade in it. Remove from heat, and place chicken into a baking dish. In a small frying pan, sauté the mushrooms in a little butter. Brush each of the chicken breasts with the reserved honey mustard marinade, saving a little to serve on the side when the dish is finished. Season chicken with some salt, pepper and a dash of paprika. Place two pieces of cooked bacon crosswise on top of each chicken breast. Spoon 1/4 of the mushrooms on top of the bacon. 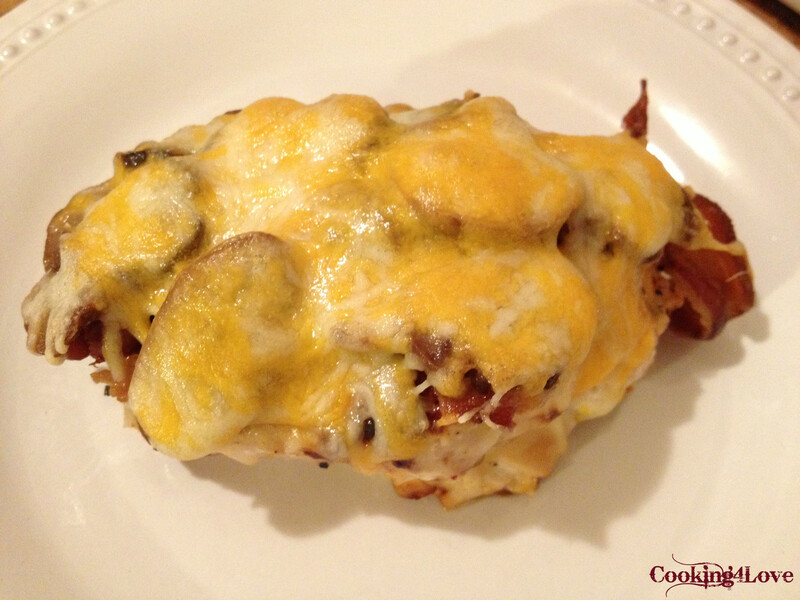 Sprinkle 1/4 cup of the Monterey Jack cheese, then 1/4 cup of Mozzarella on top of each piece of chicken. Bake for 7-10 minutes, or until cheese is thoroughly melted and bubbly. This entry was posted in Chicken, Main Courses / Dinner, Recipes and tagged alice springs, bacon, chicken, honey mustard, Monterey Jack cheese, mozzarella, mushrooms, outback. Bookmark the permalink.